Hepatitis B Virus and Hepatitis C Virus are deemed the most dangerous of the known Hepatitis viruses. The World Health Organisation (WHO) estimates that more than 240 million people have chronic (long-term) Hepatitis B Virus infections and more than 780,000 people die every year due to the acute or chronic consequences of Hepatitis B. The WHO also estimates that 130–150 million people globally have a chronic Hepatitis C Virus infection and up to 500,000 people die each year from Hepatitis C-related liver diseases. A vaccine is available for Hepatitis B and the farmaceutical industry is hard at work to create a vaccine for Hepatitis C.
In contrast to both Hepatitis B and Hepatitis C, Hepatitis A does not seem to get much attention in the media. Yes, in most cases an infection with Hepatitis A Virus is self-limiting, but we should not forget that every year Hepatitis A Virus causes nearly 1.4 million new cases worldwide and it is estimated to kill 100,000 people each year. Pregnant women are particulary at risk of more severe disease, especially if infected in the third trimester of pregnancy. 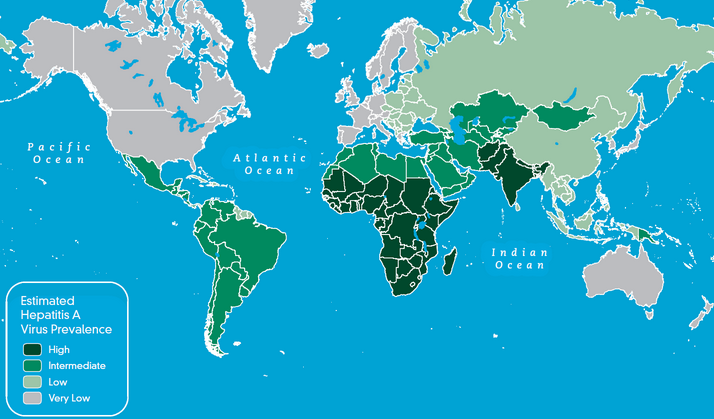 The faecal–oral route is a well-established mode of transmission for Hepatitis A Virus and outbreaks are therefore manifestations of the poor sanitation practices and lack of clean water supplies often found in developing countries. Still, doctors do not consider Hepatitis A to be a serious illness, even though liver failure and death can occur sporadically from an infection. A vaccine is available. Get it, even if you're not planning to travel to a region where the disease is endemic. WHO: Fact sheet Hepatitis B. See here. WHO: Fact sheet Hepatitis C. See here.